What do you do? You’ve got bees! Who you gonna call? Artesia bee removal company Bee Busters! If you have a swarm of bees that make you anxious and you just want them gone, don’t hesitate – call your Artesia bee removal experts at Bee Busters! Bees can go anywhere, so must an Artesia Bee Removal Service. Even a familiar landmark in Artesia, The Water Tower. I wonder if the tower ever had to have a Artesia bee removal service remove bees from it? The tower holds 50,000 gallons of water and was owned by the Southern California Water Company before it was sold to the city government. It was bought to be used as a point of historical interest and to give some special identity to the community. The tower has been painted green, and has the name Artesia painted on two sides. The city is now trying to have the tower declared as a Historical Landmark and citizens have been approached to provide historical information and photos. While the water tower is surely delightful, it is little consolation to residents and business owners who have bees living in their walls. If you see bees and bee hives in your vicinity, you should not panic as bees don’t harm you unless provoked. However, if you disturb them, there is a chance of the bees, wasps and yellow jackets stinging you. While a single sting is not that dangerous, multiple stings can be life threatening if you are allergic to bee stings. 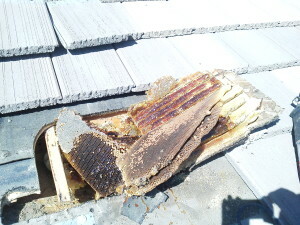 So stay clear of the bees, and turn to the best in Artesia bee removal service , Bee Busters, for help. 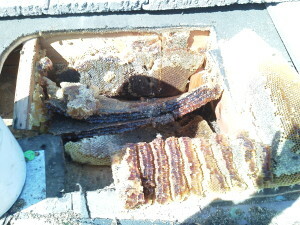 They are professionals at Artesia bee removal service as well as beekeeping. 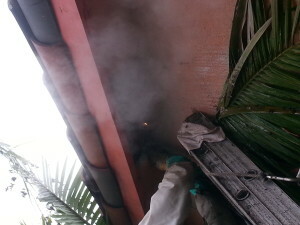 Bee removal should constitute not only the removal of bees, but also the removal of the hive. If the hive is not removed, it not only causes odors from dead bees and dead brood, it also attracts ants, rats, roaches and mice to the hive. On top that, it attracts new bees to move in. If you are experiencing bee problem while living in Artesia, don’t panic. Just pick up your phone and call Bee Busters, Inc. at 949-497-6264 or 714-731-1959 to have a team of professional bee removers take care of the problem. For Bee Removals in Artesia, call Bee Busters today!